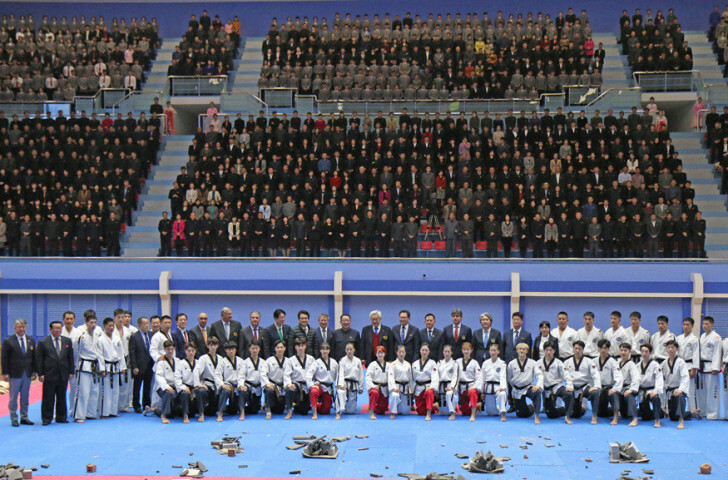 Demonstration teams from the two international taekwondo governing bodies provided huge entertainment for more than 2,300 people packing the Taekwondo Hall. "Among the four joint performances they have displayed so far, this one was the best," WT President Chungwon Choue said. "They seem to get better and better. "'I'm looking forward to their next performance. "Today has shown that there is far more that unites us than divides us. "Taekwondo has the power to open up dialogue and contribute to more peaceful understanding between nations." The joint-demonstration followed on from a historic agreement signed between WT and the ITF which will see the two federations form a joint committee by the end of the year in an effort to integrate the sport. WT and ITF athletes shook hands and some of them embraced each other. For many, it was an expected reunion at the same venue after their joint performance in April. Among the dignitaries who watched the event were ITF President Yong Son Ri and the North's National Sports Guidance Committee chairman Hwi Choe. After the event, Choe invited the WT delegation, ITF officials and athletes to a special dinner at Okryugwan, where he congratulated the two organisations for their achievement. The WT demonstration team opened the show with a fusion of poomsae and modern dance before carrying out "blindfold breaks", in which the strikers have to hit the targets only by hand bell sound. Then came a series of coordinated breaks involving high-level punches and kicks and choreographed fight routines. After 30 minutes of the WT's performance, the ITF team marched on in traditional, all-white dobok without any background music. The ITF athletes' performance was full of power moves, breaking bricks and tiles with kicks and enduring strikes across their limbs and torsos. While WT's performance was more colourful, the ITF's appeared to be more traditional, emphasising power and realistic fighting skills. Their joint poomsae wrapped up the evening and the crowd reacted enthusiastically with a thunderous applause.